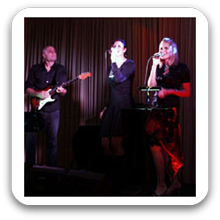 Sydney Trio 525 – A dynamic three piece cover band that provides the complete live entertainment package for weddings, corporate events and private functions. Based in Wollongong NSW, the trio consistently delivers premier live music to the Illawarra, Sydney and beyond. The group’s rich harmonies feature beautiful vocal talents with soulful acoustic and electric guitar sounds. With decades of experience between them, this exciting collaboration is a rare treat. The smart solution – an ideal combination of acoustic-pop and electric-dance music tailored to suit your event perfectly from beginning to end. Relax and enjoy – two female vocals with live acoustic guitar. This rich and organic acoustic-pop sound creates the perfect atmosphere for cocktails, canapés and fine dining. When it’s time to party! – two female vocals with live electric guitar plus pre-recorded backing band. Guaranteed to get people up dancing and having fun. The trio’s repertoire has broad appeal with an impressive variety of popular cover songs from the 60’s through to today’s Top 40 hits. Whatever the occasion, Sydney Trio 525 will entertain and impress!